It’s Friday! I actually took today off (yes, I know some of you have started your summer, but I still have one more week). My baby graduates from preschool today, he is growing up way too fast. So I took the day off to attend his special ceremony and make his day special. Here are a few other happenings from my week. 1. 5 days left!! My report cards are done, so now I can enjoy this time with my kiddos. We have been in countdown mode since day 10. Each day we have a fun new activity in the balloons to do. My friend Susan posted the activities that are in each balloon on her blog. 2. One of my sweetest girls brought in a portrait she painted of my on a canvas. I can’t wait to find a cute place to hang it in my class when school starts back up. She put a smile on my face. 3. I have been an organizing fool in my classroom this past week. I have purged so many things, and it feels good. I plan to change my room around next school year, so I am trying to clear out some unused items. I thing I did this past week was pull out all of my 100 piece puzzle for the kids to work on when they had extra time. They (an me, I love puzzles) matched missing pieces with the correct puzzles. When a puzzle was completed, I turned each piece over and wrote the same number on each piece. Now if I find a missing piece and it has the number 5 on the back I know to put in puzzle bag number I hope this works! 4. I’m weird in that I like to begin to prep for next school year at the end of this school year. My kids have really loved writing and I am excited to give them their summer journal strips and journals. Well, I think I am going to continue with the same thing throughout year next year. I made up journal strips for the year. You can can them month by month, or bundled in one nice package. 5. And last, this won’t happen until July but I am super duper excited! I’m already thrilled to get to go the the Extraordinary Educator’s Conference. Well, while I was searching around for fun things to do in Chicago I discovered there was a great concert happening at Wrigley Field one of the nights we are there…Jason Aldean’s Night Train Tour with Kelly Clarkson. So now were going to that as well. There you have it! 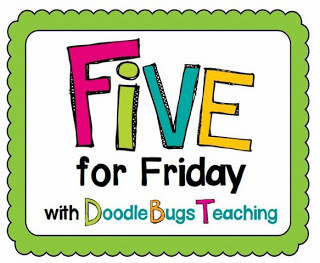 My Five for Friday. Just thing next Friday, I will post and that will beginning of my sweet summer. Cheers! Thanks so much for the tip with puzzle pieces. I almost gave up on puzzled in my class with first graders because the pieces always get mixed up and lost. I will try this! I love the idea of the balloon count down, although I have awhile until the end of the year here in Australia. I also have a similar painting that was given to me by one of students at my last school. It sits proudly in my classroom. Enjoy your break.